The Baltimore City Delegation announced in an emergency news conference that they fully support the city council's letter asking Mayor Catherine Pugh to resign. BALTIMORE, Md. — The Baltimore City Delegation announced in an emergency news conference that they fully support the city council's letter asking Mayor Catherine Pugh to resign. All 14 City Council members sent a letter to Mayor Pugh Monday morning stating: "The entire membership of the Baltimore City Council believes that it is not in the best interest of the City of Baltimore, for you to continue to serve as mayor. We urge you to tender your resignation, effective immediately." On Monday evening during the final day of the 439th session of Maryland’s General Assembly, city delegates took a position on the mayor's request to return to City Hall and resume her duties. "Once the city council, who has to work with the Mayor day in and day out, unanimously came together and made the decision, we thought that we needed to stand in solidarity with them because we are the state legislative body in the House of Delegates," said a Delegate. 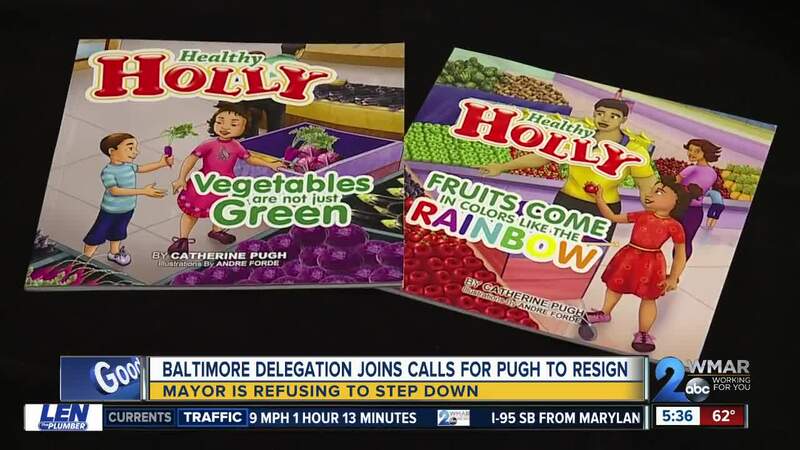 The call for Pugh's resignation comes as she requested to take a leave of absence as mayor following her controversial "Healthy Holly" book deal with the University of Maryland Medical Systems and other businesses in the city. "We need some continuity in the City of Baltimore and we feel that this is in the best interest of the people that we represent," said a Delegate.